I've been wanting to go to a Mommy & Baby bazaar since I was pregnant, but never had the chance. Finally, we went to the Expo Mom event today at Rockwell Tent. I've been wanting to go to this one because there were two vendors I had to checkout: Mommy Matters for nursing wear and Celestina and Co. for pretty bows and bands. Good thing we came the morning of the first day - there weren't too many shoppers around yet. It was a relief not to have to elbow your way through a crowd just to get a good look at the goodies. And yay, the first booth I saw inside the tent was Mommy Matters. I own one of their nursing dresses - an Indian-inspired maxi that is perfect for the beach or a hot day out. I love it, very comfy! So I was looking for something similar. Too bad I didn't find any. I couldn't check out everything they had because it was a bit of a hassle to browse through their cramped display. The hooks were overstuffed, so the clothes which were hung in front kept falling off every time I checked out those at the back. For someone who was on a hurry, it was frustrating. I would've stayed longer and bought more clothes if it was easier to shop at their booth. I ended up buying a gray number that I wasn't too excited about, but was the only thing they had in my size out of the three pieces I tried. But I love how I'm a size Small in their clothes, and not the usual Medium. Hihi. I found the Celestina & Co. booth further inside the tent and I was not disappointed. 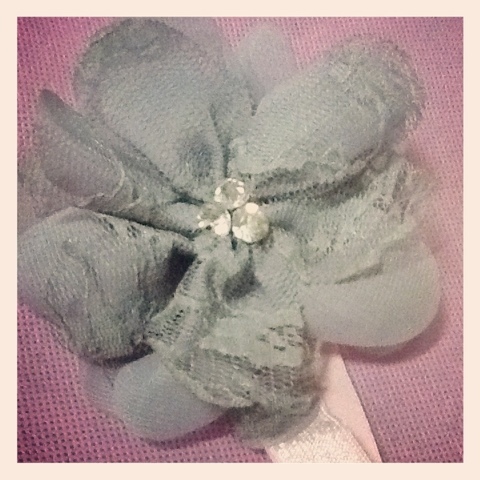 I've been browsing through their cute baby headbands and bows online for weeks now, and I wanted to see the stuff up close. Ally has one of their frilly pink headbands and a small cream bow, and they look absolutely adorable on her. So I wanted to buy more. I bought her a gray and pink band this time. Super cute. 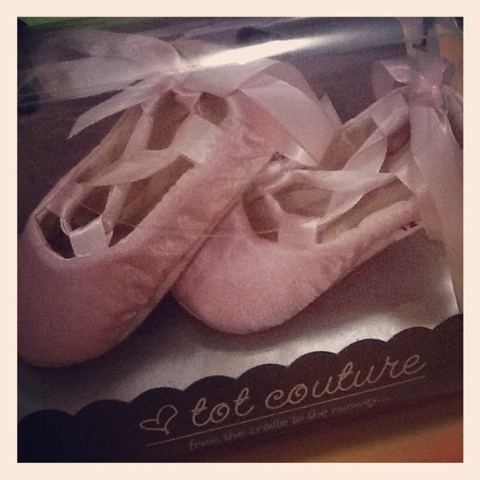 But my favorite purchase is the cutie patootie pair of pale pink ballet flats I got from Tot Couture. I haven't heard of this brand before, and I am glad I stumbled upon them at the bazaar! They have the cutest, comfiest crib shoes! Unlike the usual baby shoes with hard soles, these are made of soft fabric so they are easy to put on wriggling baby toes. They come in different styles usually reserved for grown-ups - like peep-toe or sling backs - and some in the prettiest of prints! It felt like getting a bargain at Php350 (less than $10). What first drew me to the booth was how they were displayed - beautifully packaged in cute acetate boxes in the shape of a purse! Packaging can really tug at a customer's heartstrings, I should remember that the next time I join a bazaar as a vendor! Most of the stalls offer discounts - like Baby Company who has baby carriers at 20% off, Baby Shower Studio who had a Php500 discount for a Php3,500 photography package, ManilaBaby who had swimsuits on sale, and a lot more stalls I can't remember. One other great thing about the event are the freebies. There's a pick-a-prize for those who joined Expo Mom's tagging promo on facebook. Someone lucky won something from Avent. I just got a bottle of Tinybuds baby powder. Haha. Some brands give you something extra when you purchase. 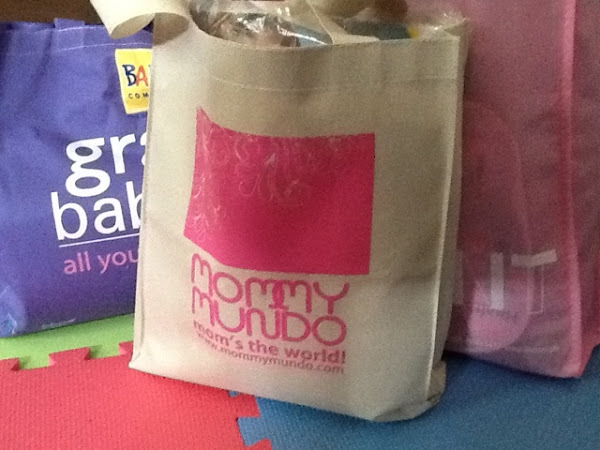 And I got three swag bags total, one each from Mommy Mundo, Avent, and Baby Company. The bags contained product samples, magazines, and stuff from sponsors. Most of these we can't use - like the tiny newborn diapers that are too small for my 7-month old who now wears size Large nappies. But I love the swag from Baby Company! 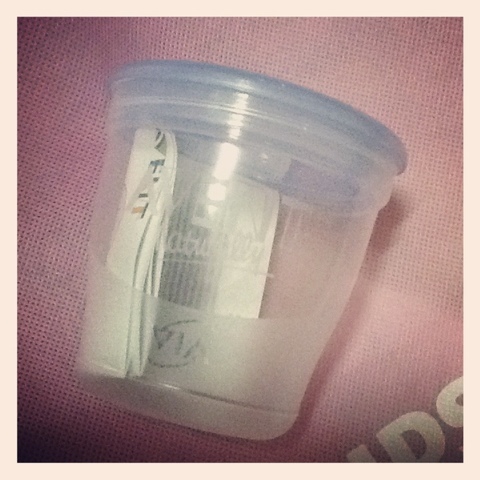 I got all sorts of useful stuff in their bag, and even an Avent Via cup for storing breastmilk in the fridge. That, I can definitely use! If only I could, I'd go back to the bazaar tomorrow. I forgot to go back for that cute baby tankini at Manila Baby shop. Sigh. Expo Mom 2012 is happening at the Rockwell Tent today, May 5, until tomorrow, May 6, 10am to 8pm. Entrance is free for Mommy Mundo Passport holders, and Php25 for everyone else.